This competition is now closed. Congratulations to Claire, Becky & Imogen! Booja Booja have been one of my favourite vegan companies for a long time and I’m really happy they decided to take part in another giveaway here, the last one was so fun. This UK based company make deliciously decadent truffles and amazing coconut based ice creams which are a summer staple for me. Their Banoffee Toffee truffles are my current favourite product and if you win this competition you’ll get to try them! 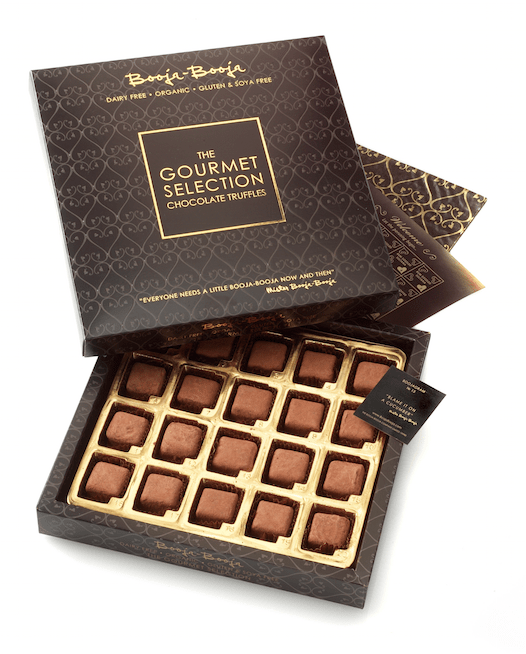 Booja Booja have generously donated three boxes of their Gourmet Selection of truffles which have an RRP of £16.99. This scrumptious assortment of organic handmade truffles features some of Booja Booja’s classic flavours, the afforementioned Banoffee Toffee as well as Stem Ginger, Around Midnight Espresso, Rum Sozzled Sultana and Champagne. As well as being vegan these are soya and gluten free. The three winners will each win one box and I can’t promise that I’m not a little jealous becuase obvioulsy I can’t enter to win this one myself! To enter leave a comment below before 8pm GMT September 5th telling us which Boojalicious flavour you’d be least likely to share. Please be sure to leave a valid contact e-mail address so that we can contact you if you win. The winners will be randomly selected and announced after the giveaway has ended. This competition is open to residents of the UK and ROI only. Banoffee banoffee banoffee! I will be singing that little ditty all day! Definitely wouldn’t share the Rum Sozzled Sultana truffles! I love all their flavours but would have to pick Banoffee toffee ones. I would definitely like to keep those for myself! The Banoffee for sure. Which is good because my husband would want to ginger for himself, so no one will be hurt. There’s no way I’d share the champagne. Decadence is best enjoyed solo! Has to be rum sozzled sultanas. I’d share them with whoever I meet because everyone deserves to taste these delicious babies. Hoping there’s a praline option – I’d be struggling to share those! My way past…is what that should have said…doh. ???? I would totally never share the banoffee ones. There’s something about that banana toffee combination that is so good. I wouldn’t want to share any of them but I suppose if they left me the champagne truffles I’d be happy! OMG, Banoffee Toffee! I love all things toffee. I would not give this one up! Yum! Rum sozzled sultana, of course. Rum raisin is a classic combination. Champagne! Booze and chocolate – it’s a winner, and Booja-Booja make the best vegan chocolates! I love love love the espresso ones!! I’m a coffee addict! I just had a few of the champagne ones earlier today, and it didn’t occur to me to even think about offering to share them with anyone around me. Whoops. Toss up between around midnight espresso and banoffee toffee. My favourite is definitely the hazelnut one. Oh my god. No one else would even be allowed to look at them. I certainly wouldn’t be sharing the midnight espresso. pretty sure I wouldn’t share any of them! I’m that greedy. But definitely not the champagne ones because I remember those being pretty effin epic! I would definitely need to keep the expresso ones to myself. It’s not listed here but the hazelnut ones I cannot share with anyone!! They are delicious! Espresso of course! How have I not tried that flavour? Thanks for the chance Jojo! They all look amazing, but I’m pretty sure the hazelnut crunch could win a deathmatch against any other flavor. Ooh, it would be a toss-up between the champagne and the hazelnut! I’ll happily give away any of the other ones, but you can pry those two from my cold dead hands. I find the expresso flavour truffles nearly impossible to share! In my opinion, they’re the perfect blend of coffee and chocolate. Ooh yes please, would love to try these. Champagne!!!! Always find it difficult to share in liquid or chocolate form!!! I love the hazelnut!! Ooooh and the raspberry!!! share??? no way! especially the stem ginger- they’re my favourite treat! gingerlicious! Oh, those look gorgeous. I would have serious trouble sharing the stem ginger bonbons. Really? Have to share? Okay, no way Around Midnight Espresso…. Banoffee, or champagne, or . . . all of them. I wouldn’t want to share any of them!!! Ohhhh, those espresso ones would be all miiiiinnnne, because coffee coffee I drink coffee, coffee coffee everyyyydayyyyyyy. Espresso, and chocolate…I may die and go to heaven! Oh, I think I would have the most trouble sharing the Rum Sozzled Sultana and Champagne ones. My family will be all, “But why is the rum gone?” and I will pretend I have no idea what they are talking about. Wouldn’t share any – never had the opportunity to try any myself, so no way would anyone else get a look in!! RUM SOZZLED SULTANA!!! No question! Absolutely no chance I’d share those! Oooh. I want some of that bannoffee toffee! I Wouldn’t share the Rum Sozzled Sultana!!! Nom Nom! This vegan would not share the rum sizzled sultana ones – delicious! I’d be disinclined to share any of them really but I wouldn’t let anyone get their hands on the champagne truffles! I wouldn’t share any of them!!! I want all the chocolate!!! Although if I was pushed to choose it would be the banoffee toffee.